This piece is bold, yes, but you can totally rock it. Products L-R: Missguided, Pretty Little Thing, GAP, Forever 21. Metallic puffer jackets have been trending since the winter season started. These fresh takes on the classic puffer coat are fun and come in tons of different colors. What I love most about metallic puffer jackets is that they can be worn casually, say to class, and worn dressy, for going on a date to the movies. Here are some examples of how to wear a metallic puffer jacket to class and on a date to the movies. 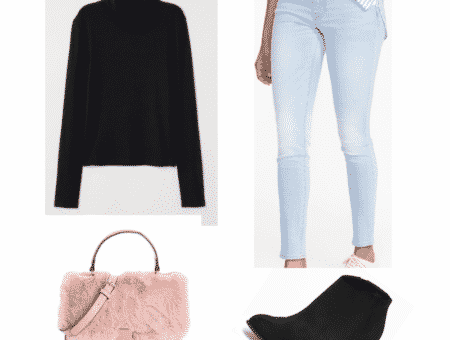 Products: Metallic puffer jacket – Miss Selfridge, Doll t-shirt – Boohoo, Jeans – Boohoo, Backpack – Forever 21, Earrings – River Island, Slip on shoes – Steve Madden. This outfit for class is cool and collected, while also being ultra-comfy. What I love most about the set is the graphic t-shirt. Slogan tees like this can really make an outfit. The idea is to have similar neutral colors throughout the look to match the metallic puffer coat. You don’t want to overdo silver accessories because the puffer is silver and very flashy. So I added gray slip on shoes for contrast, as the jeans are dark washed and the t-shirt is black. I wanted the shoes to match the puffer in a subtle way. 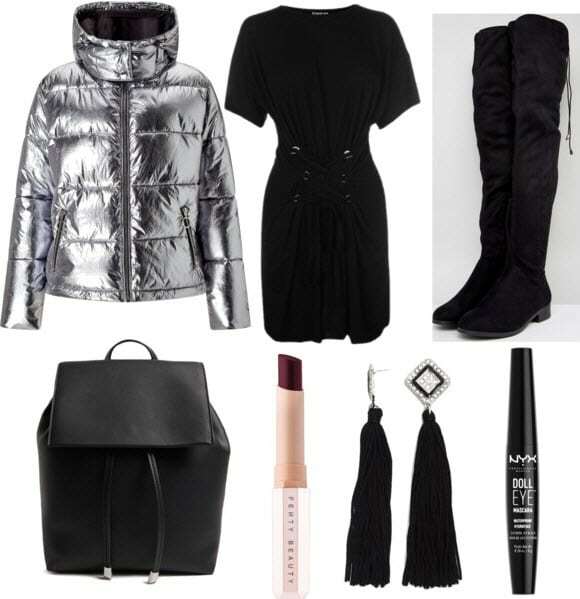 Products: Metallic puffer jacket – Miss Selfridge, Corset dress – Sports Direct, Boots – ASOS, Backpack – Forever 21, Lipstick – Fenty Beauty, Earrings – Forever 21, Mascara – NYX. 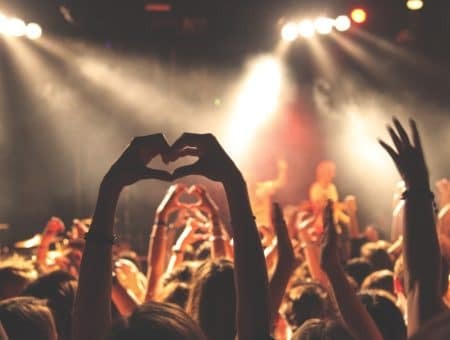 When going on a movie date, you can dress up or dress down. Sometimes you may not feel like wearing heels when going to the movies so flat over the knee boots are a great alternative — they’re dressy but not uncomfortable. Bag-wise, I used the same Forever 21 backpack from the first set due to it coupling nicely with this set. Tassel earrings are my favorite jewelry trend! They’re so adaptable; you can wear them with almost anything. I wanted a dark, moody lip for this look so I opted for a Griselda, a deep burgundy color from Fenty Beauty. Finally you can never go wrong with a little mascara to make your eyes pop if you don’t want to do a full face of makeup. How would you style your metallic puffer jacket? What’s your idea set of styling a metallic puffer jacket? How would you wear it to class or a night out? We’d love to hear from you! Comment and let us know.